Ultius is a simple, convenient, and reliable way to connect with a highly-qualified writer. Great reviews, free revisions, and 24/7 support. If you meet these requirements, we would love it if you applied. Connecting with a writer on the Ultius platform is quick and simple. Just tell us what you need - we'll match you with a writer and review their work before sending it to you. Tell us what you need written or edited by filling out a brief form. We will find you a suitable writer within a few short hours. Our editors will review the writer's draft and make corrections. Get an email notification to download it when it's ready for you. Ultius offers many great features that are unmatched by other platforms you find online. American writers, great support, and industry-leading security are just a few of the great perks we offer. With so many great features, it's impossible to list them all. Below is a snapshot of what you can expect when you order from Ultius. Your order will be written just for you based on your instructions. We don't re-sell or re-use anything you order. Anti-plagiarism tools like Copyscape check that your work doesn't match anything else on the internet, ensuring originality. If you are unhappy, we're more than happy to revise it for free. Just submit a revision request within seven days of final delivery and we'll get you a revised version within three days. Your life is on-the-go and so is Ultius. Conveniently manage your orders, messages, and drafts from all desktop, tablet, and mobile devices. Our platform is designed to look and work nicely no matter where you are accessing it from. Ultius only hires qualified American writers from accredited academic institutions. We use an extremely selective hiring process to filter out candidates. For every 100 writers that apply, we only hire six. Being selective sounds simple, but it means that we have to make lots of very tough "no" decisions for every "yes." We don't just connect you with a writer—we also ensure that the process goes smoothly for you. Our Essay writing help services include a thorough quality and review process. Let our technology match you with the best writer possible. You can also upgrade to a top performer or choose your own expert. We will match you with the best writer possible based on your order details. Best available is the default option and the best choice for first-time customers. Upgrade to a graduate writer and work with the top 10% 4 in our writer pool. This is our most popular writer option. It is highly recommended when you need to work with the absolute best writer possible. Work with a select expert from your favorites list. This option is recommended for long-term projects and when you want to utilize a trusted writer. We believe that the support experience is just as important as the quality of our writers. That is why tremendous client support is a core part of our daily mission. Any device, any platform We're only one tap away on any device: computer, tablet, or mobile. You can reach us through voice, email, SMS, live chat, or even Facebook messenger. Any time Our support team is truly available 24 hours a day, 7 days a week and 365 days a year to answer your questions. Real people, fast resolutions Each of our Las Vegas based support team members are thoroughly trained and enabled to solve your problem in a timely fashion. Your privacy is extremely important to us. That is why we carefully designed our policies and infrastructure around cutting-edge technology and best practices. Complete confidentiality Your order details, personal information, and transaction are private. Writers identify you by a unique client ID number and we don't share your personal information with third parties 5. Dial-in PINs When you call our support team or interact with us about your order, we will ask you to verify your account with a PIN code. You create this PIN when you register your account. 2-Step authentication = double security Staff members are required to use two-factor authentication for all company issued accounts. This adds an extra layer of protection to your sensitive order data. 256-Bit SSL encryption Our entire web property is protected by 256-Bit SSL encryption. This technology ensures that your order communications cannot be intercepted by malicious third parties 6. Google Apps for Work secures our internal company communications related to your orders. Armor is a leading security-focused hosting provider that houses our infrastructure. McAfee Secure scans our website daily for any malicious code and provides our trust seal. Cisco provides our internal server two-factor authentication tool. CloudFlare manages all of our website traffic, filtering out the suspicious characters. GeoTrust issues our SSL certificate, providing 256-bit encryption for all communications on our website. Customers from around the world rave about our custom writing and editing services. They love everything from our talented writers to our speedy customer support. It's no wonder that we are the global leader in consumer writing and editing services. We are proud to say that our great ratings come from genuine customer reviews on reputable third-party review platforms. For each review on our website, we provide the link to the original source. This is our commitment to verified reviews. Outstanding experience... To be honest, I was extremely nervous about the process. However, the customer service was outstanding and my writer was fantastic. I will definitely be back and highly recommend those who are on the fence. I’ve used a bunch of sites like this, Ultius is by far my favorite. The customer service is fast and excellent. Delia was super helpful with my questions about my order. My writer is nothing short of amazing. I love this program and the open ended conversations I am able to have with this writer. He/she has been super helpful and receptive to all of my feedback. Our discussions are concise and I appreciate the extra help. First time using this service and it was great. Will definitely use the service again or recommend it to friends. Lizzy, in customer service, was wonderful answering all my questions. Delia is absolutely amazing! She has helped me so much, her customer service was outstanding and she did everything in her power to help me, and to make sure that I was 100% satisfied with my experience with Ultius. I love Ultius . Very responsive customer support! Patient and taking care of the issue till is solved . Great writers too! Jobs are done on time . I am very pleased with Utilus. My experience with Ultius has been really good. They are fast professional and very helpful when you have questions. I would recommend others use this service. The best site ever! never had an issue and very reliable. The writers are also very nice and understanding if you want to change things or edit something that was written. Amazing fast service! I selected the wrong due date and decided to contact the live chat for help. Sara R. made the process very easy and stress free to fix the mistake. Nothing but great experiences from this site. I had a great experience with the writers at Ultius! The papers were great and they stayed in contact with me. This is the only place I will use from now on! I love Ultius!! I can trust them to deliver excellent service; both from the writers and customer support!! The writers follow my instructions with minimal contact. Superb service! I have used you guys for more than 30 papers and article reviews. When I was low on time, you guys helped me out. My papers were always well written and submitted back to me on time. My grades always remained high. Thanks for your great work. I have been using you guys for a long time now, and I am pleased to say that I have never had any problems when it came to my orders. I have used your guys for different papers of many different lengths and those papers were always on time and exceptionally written. I have never gotten a low grade on something that you guys have written for me. Thanks very much. Ultius is an amazing organization. I was in a tough place and unable to work this project. This company was able to provide me an incredible mentor who was thorough in research and also provided great insight on a topic that I was quite familiar with. The professionalism and promptness of the team really exuberates academic excellence. Great experience. The writer exceeded my expectations and I have submitted a new project with them for my business. Customer service is extremely responsive. The work they do is original, I ran the project through 4 different plagiarism checkers and they came back with less than papers I've written myself. Highly recommend working with this company and their writers. I was little wondered about my order that the due date was coming close. I asked about the progress of my order and she replied kindly with a satisfying response. Thank you Ultius! Lizzy Z. was incredibly great and kind. She was patient and took her time to solve my issue. I had an issue with my money being refunded and it got solved today. Lizzy is very pleasant to deal with. Learn more about our services, browse various customer resources, and get answers to your most important questions. How pricing is determined, pricing tables, and what payment methods we accept. See available writing services. We do editing and business documents too. Explore career opportunities with Ultius as a writer or staff member. Browse free resources that you can use for your own research and writing. Get expert writing help with document guides, template downloads, and more. Get answers to the most common questions customers have before ordering. Are you interested in becoming a writer on the Ultius platform? We are always looking for talented writers to join our team. Click the link below to read more. Our writers enjoy these lasting benefits upon being hired as a freelancer. Before applying, please understand that we have some minimum requirements in terms of your educational attainment and access to required software. The application process takes anywhere from a few weeks to two months and includes the steps listed below. The process starts when you submit your online application. We will review your submitted resume and reach out if you are a good match. We will ask you to write a brief sample with provided instructions. We will schedule a brief phone interview with you to ask some follow-up questions. Upon being hired, we require you to take an internal orientation course. Apply now or follow the links below to learn more about the position, the company, and anything else. 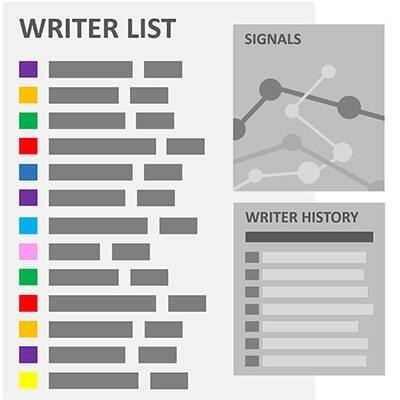 Our Availability Intelligence technology ensures that if you request a specific writer, there is a 90% chance they will be available and accept it. When you use our advanced requested writer feature for your custom writing order, we work extremely hard to ensure that your writer is going to be available. We use various signals and internal data points to predict whether the writer will accept the order in the first place. These are just a few of the many signals we use when deciding whether to show a writer as available - and we're improving our technology every day to make it even more reliable. As of October (2016), the requested writer acceptance rate is 90%, meaning that there is a 9/10 chance they will be available. Please make sure to read our writer availability policy before requesting a writer. If you are looking for a writer online, you have a million options to choose from. Here are the main reasons why you should choose Ultius to connect you with a writer for your custom writing, editing, and business document preparation needs. Because of our selective hiring process and commitment to only hiring American writers, Ultius boasts having better writers than anywhere else on the world wide web. 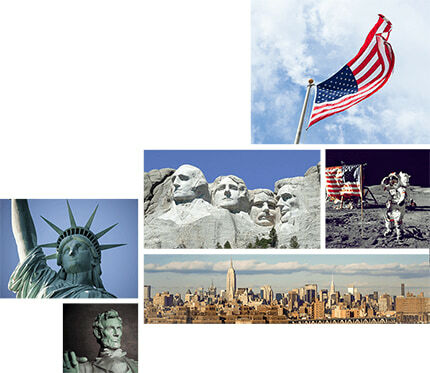 Ultius, Inc. is an American company with offices in Wilmington, DE and Las Vegas, NV. We don't outsource writing and customer support, ensuring you only interact with native English speakers. Call us toll-free, SMS us at 3:00 AM, or live chat us from your mobile phone. We are available for you whenever you need us, however you need us. Your business with us is safe and confidential. We don't share your private information and don't make customer orders available for search engines to see. Order with confidence knowing that hundreds of thousands of customers around the world trust us with their orders—1,000+ great reviews, A+ BBB rating and 4.7/5 stars. All orders get manually reviewed by our Quality Assurance team before you get it, ensuring a higher level of writing quality. You also get free revisions if you are unhappy. SM Availability Intelligence is a service mark (registered on December 12th, 2016) owned by Ultius, Inc. The mark represents our proprietary technology that utilizes various signals and data points to determine whether clients can request specific contracted writers. TM All third-party company logos and names are registered trademarks of the respective company. 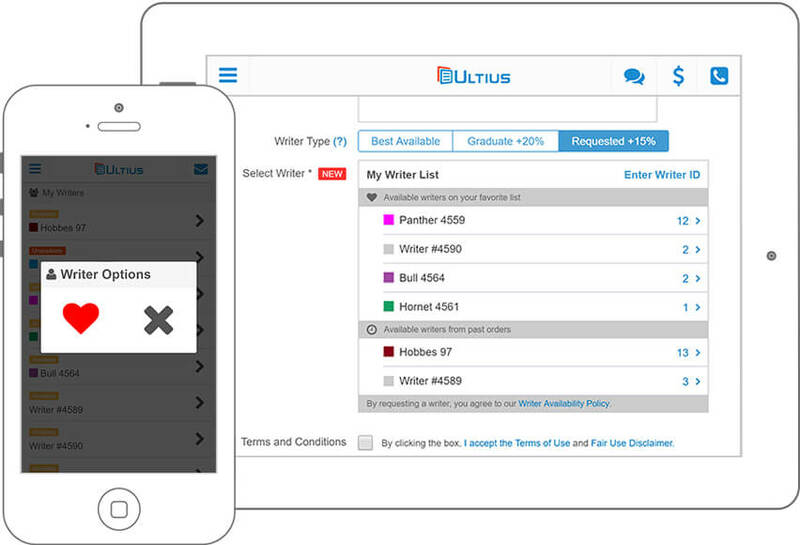 1 Ultius, Inc. uses various online tools to ensure all custom writing work is original. However, we legally cannot 100% guarantee that it will be original. This may be due to software failure, indexing issues with Copyscape, unpublished (offline) content or human error. In the case that your custom writing order is not original, we will be more than happy to have a different writer re-write it or provide you with a full refund. Copyscape is a trademark of Indigo Stream Technologies and is not affiliated with Ultius, Inc.
2 Free revisions are offered for all custom writing, editing, and business writing services. After your order is completed, you will have seven days to request a revision and we will upload it within three days. Urgent revisions may have additional costs and other restrictions apply. Please read our full revision policy for more information. 3 Writer hiring data is from the entirety of 2016 and based on 4,844 initial applicants. The data provided represents a confidence interval of 10% for each subset of data within the entire hiring process. 4 The graduate writer pool represents a total of 7.3% compared to the total number of writers we have in our database. This figure is accurate as of October 4th, 2016. 5 Ultius, Inc. will not share your private data with any third-party, unless required to do so by a court order. As of December 14th, 2018, the company has never had to give up user data. 6 No platform is entirely secure, and that includes Ultius. Despite our efforts and track record, we legally cannot promise a 100% success rate of securing our platform, your data and communications exchanged. Please read the terms and conditions for more information about limitations of liability. 7 Ultius, Inc. utilizes security vendors like Armor, CloudFlare, Google Apps, GeoTrust, McAfee, and Cisco. The company logos listed are registered trademarks of their respective companies. Ultius, Inc. claims no association or partnership, whether expressed or implied. 8 Aggregate review ratings are derived from reviews.io, Glassdoor ®, facebook ®, the BBB ®, Google ® and SiteJabber ®. Review vendors are not affiliated with Ultius, Inc., whether expressed or implied. As a matter of policy, the BBB ® does not endorse any product, service or business. Current BBB and other rating data is current as of December 10th, 2018. All logos and marks are trademarks of the respective company. Glassdoor ratings represent employee satisfaction data and is not included in the customer review data aggregate rating.